There are two Swiss guys on proper BMW touring motorbikes who are looking at us pretty sceptically. They're all decked out in black Kevlar riding gear, with gloves and boots, their helmets hooked up with microphones so they can communicate on the road. Total pros. My girlfriend and me? Not so much. We've pulled up at this highway rest stop on a silver, 125cc Vespa scooter with the words "hire me" slapped across the side. It doesn't exactly scream professionalism. Neither do our riding outfits, which eschew traditional leather in favour of quick-dry boardshorts and cotton tees. We don't have microphones in our helmets; my girlfriend communicates with me by yelling in my ear. It's easy to make yourself understood when you're going 40 kilometres an hour on a mode of transport that makes as much noise as a dishwasher. So I can understand why it would appear to the Swiss guys as if we're horribly unprepared for two-wheeled travel around this big Italian island. But that's where they're wrong. 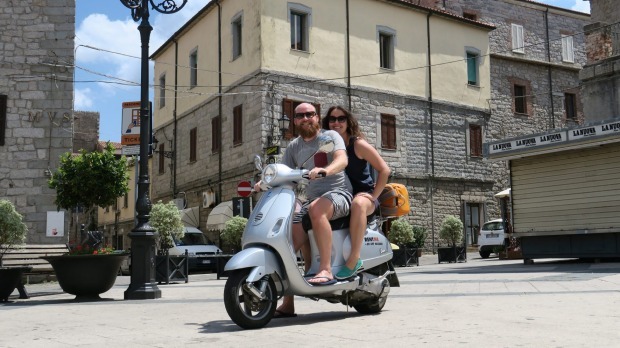 Because Sardinia, quite possibly more than any other place in the world, is absolutely made for a casual adventure on a little Italian scooter. A ride on a Vespa is like a perfect day spent by the beach, languid and sun-kissed and free. This is an island of incredible natural beauty, a place of rugged hills that drop steeply into the bluest of blue waters, of white-sand beaches and rocky headlands, of rustic farmland strewn with boulders of granite. And best of all? The entire island is hugged and crisscrossed by winding, slow, perfectly paved roads. It's paradise for two small wheels. This trip is actually a sequel to a previous Italian scooter journey I'd taken, a solo ride around Sicily where I'd fallen in with love the feeling of freedom on two wheels despite the hair-raising nature of Sicilian traffic. This time I was travelling with my girlfriend riding pillion on our Italian-made steed, and we would be exploring Sardinia, a fiercely independent state that is somewhat reluctantly part of Italy, a playground for Europe's rich and famous as well as a rustic, almost primitive land of stone farmhouses and ancient villages. 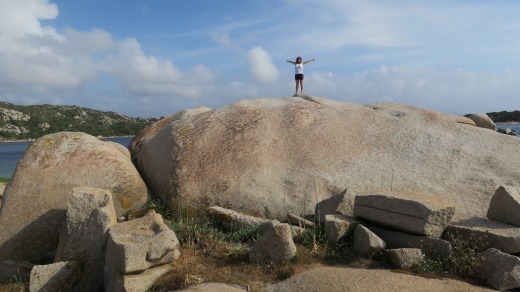 Our adventure began in Olbia, an industrial and none-too-charming town in the north-east of Sardinia. Olbia is ugly, but it's also the gateway to the Costa Smeralda, a stretch of coastline that you'd already be familiar with if you were a Russian oligarch with your own superyacht, or a French film star with a few months to kill. It's not historic, it's not charming, and it's not cheap. 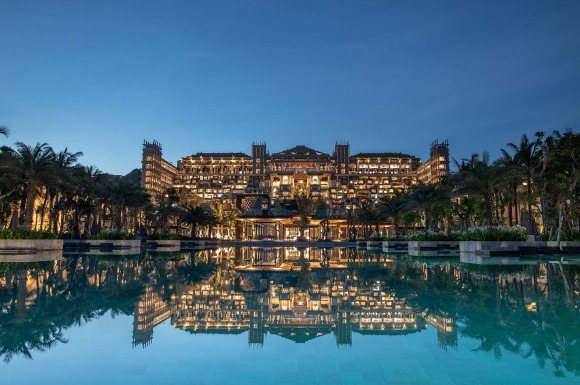 But the Costa Smeralda is supermodel beautiful. And we would be seeing it, smelling it, living it, by Vespa. It's a simple form of transport, the Vespa, and yet so romantic, so perfect for island life. A ride on a Vespa is like a perfect day spent by the beach, languid and sun-kissed and free. 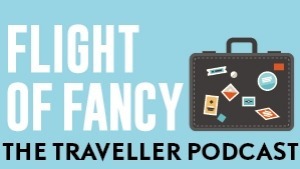 In fact there's only one small problem: luggage. Romantic the Vespa is, but it's no packhorse. There's room for only one daypack on the back, which has to be tied down with an occy strap. The question, then, was what my girlfriend and I were going to do with the rest of our gear while we toured the island. A suitcase isn't going on a Vespa. But we'd come up with a novel solution: we'd rented a cupboard. We'd hired a tiny apartment in Porto Rotondo, a resort town about 20 minutes north of Olbia, to use as a place to store our luggage. 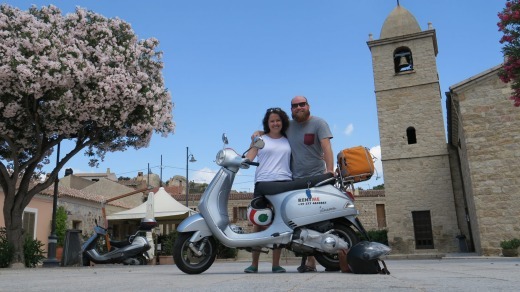 So when we landed in Olbia, my girlfriend took a taxi to the apartment with our gear while I headed down to the rental shop to pick up our stallion: a 125cc Vespa LX with a couple of small dings and that "rent me" sticker on the side. I grabbed helmets, checked directions, took a deep breath, and then twisted the throttle and hurtled down the street. Paradise beckoned. Later, my girlfriend makes use of our sophisticated onboard communication system, yelling in my ear. "Let's stop for a swim!" We're cruising past yet another stunning beach on the Costa Smeralda, the sun is beating down, the water is sparkling, and we can wait no longer. It's time to hit the water. This is day one of our road trip, a four-day adventure across the north of Sardinia. Today we're hoping to make it from Porto Rotondo to Santa Teresa Gallura. On the map it looks a long way: the road twists and bends along rugged coastline, up mountains and around headlands. In reality, however, it's only 100 kilometres or so. Easy. Even on a Vespa. One of our first stops is a small lookout and cafe in the hills above the swanky resort town of Porto Cervo. That's where the Swiss guys on their BMW touring bikes look at us so suspiciously. Sardinia is a popular destination for European motorbikers, with plenty of riders making the journey from mainland Europe into Corsica and then on to Sardinia. After a swim we speed on towards the town of Palau, where we call into a local restaurant for some typical Sardinian fare: baked provolone cheese with honey, pasta with wild mushrooms, pannacotta, and a glass of local wine. We wander around town for a while before saddling up for the final stretch. Santa Teresa Gallura is a pleasant little seaside town, with a large piazza in the centre and a lighthouse on the coast facing north towards Corsica. It's also home to Capo Testa, a cape that boasts maybe the most spectacular coastline of an island that has no shortage of spectacular coastlines. We head up there for a quick swim before going out for pizza and resting up for another day of biking. 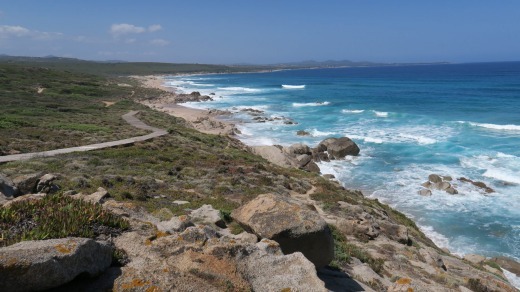 From Santa Teresa Gallura we continue along the coast as it bends around to the south, following rugged, windswept beaches past small resort towns like Costa Paradiso and on to Castelsardo. This medieval town, built in the 12th century, clings to a headland above the warm Mediterranean, a narrow, winding mess of alleyways and old stone paths, a charming place of homestays and small restaurants. We spend the night with a local family, dining on seafood while staring out over the water, dreaming of more adventure. And the next day we find it, turning the Vespa east through the middle of Sardinia, in a rough line back towards Porto Rotondo. The road begins flat and straight before it starts to wind its way up into the hills, the coastal plains replaced by rugged hills and farmland, with olive groves and grape vines lining the road as the Vespa chugs upwards. We stop for an espresso in Sedini, feeling like strangers in a strange town as the locals stop to stare at the two tourists on the silver Vespa. We continue on up into the hills, passing huge granite outcrops, looking at old farmhouses surrounded by wildflowers. It's cooler up here, and even quieter. Eventually we make it past Tempio Pausania and pull into the gravel driveway of one of those farmhouses, our accommodation for the night. Sardinia is filled with these "agriturismos", farms that supplement their income with the tourist dollar, providing bed and breakfast accommodation for passing travellers. We dine that night with Mario, the farmer and our host, eating a feast of wild boar stew and local Sardinian pecorino, washed down with rough table wine. It's nice to see this other side of Sardinia, so far away from the superyachts and the mega-rich. Soon, however, we're heading back towards the sea. We ride east along the high plateau the next day before those sparkling blue waters come back into view and we cruise down towards the coast, still laughing with glee at every sweeping turn and each new vista. We may not have all the fancy gear. We may not have Kevlar jackets or leather gloves. We may have to yell at each other to make ourselves heard. But we have two wheels. And here, that's all you need. Emirates flies multiple times daily from all major Australian hubs to Rome, via Dubai. See emirates.com/au. From there, Meridiana flies daily to Olbia – meridiana.it/en/. In Santa Teresa Gallura, the Hotel Moderno has great rooms close to the piazza. See modernohotel.au. 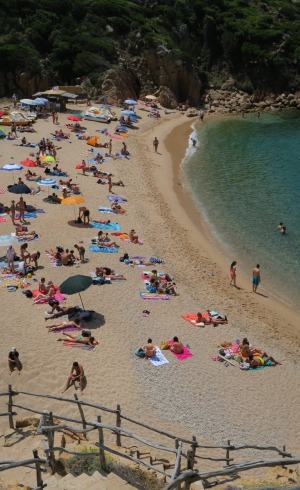 In Castelsardo, the B&B Smorfiosa & Calarina is cheap and cheerful. See bb-smorfiosaecalarina.it. For argiturismos near Tempio Pausania, go to agriturismo.it. The Vespa was hired from Olbia through Motoroads. See motoroads.com. Ben Groundwater travelled at his own expense. Before you travel, get familiar with riding a scooter. Make sure you're licensed to ride a motorbike in Australia – otherwise you won't be covered by travel insurance – and get plenty of practise at home, particularly carrying a passenger if that's what you plan to do in Sardinia. Bringing your own helmet is an excellent idea, as the quality of hire gear varies wildly, and it's also recommended to bring any other safety clothing you feel is necessary. Once you arrive in Sardinia and pick up the bike, go for a short day trip to get a feel for the local conditions. Don't attempt to ride hundreds of kilometres on the first day. Take a short trip to the beach, watch how the traffic works and how long it takes to get from place to place. If you're planning to ride a Vespa, you won't have room to carry anything bigger than a daypack. Make plans to store the rest of your luggage, either at a friendly hotel in Olbia, or by renting a cheap apartment to use as your base. While most roads in Sardinia are quiet and slow, there are highways, and there are large vehicles. Plan your trip so as to avoid major roads. Set yourself small distances to cover each day, and don't be too bothered if you need to change your plans. Above all, be alert. Don't get caught staring at those views when you should be watching the road.